Regina Strinasacchi was an Italian violinist, singer, composer, and guitarist born (in Ostiglia, near Mantua, Italy) in 1764. Her date of birth has been obscured since the day she was born, perhaps because she was illegitimately born. Most sources give the year of her birth as 1764. Three sources give it as February 28, 1761. We only know of her today because she once played a violin sonata written for her for a recital she played for the Austrian Emperor (Joseph II) and other aristocrats on April 29, 1784. Mozart was her accompanist. Articles about her are often linked to those dealing with Maddalena Lombardini because both grew up in similar circumstances. The sonata Mozart wrote for Strinasacchi was his number 15 for the instrument, K454. He wrote 18 violin sonatas in all, although these are only the ones composed as a mature artist – he composed 18 more as a child. Strinasacchi was educated at the Ospedale della Pieta (an orphanage for girls) in Venice, where Antonio Vivaldi (1678-1741) had twice been the music director. From around 1780, she toured as a soloist in Italy, France, and Germany. She was 16 years old (if the 1764 year of her birth is correct), a very young age at which to be touring. It has not been unusual for performers to present themselves as being younger than they really are, so an earlier year of birth is quite possible. She finally got to Vienna in 1784, playing one concert in March then again that fateful day in April. Mozart was very impressed with her playing – documented in a letter to his father - and the recital they presented was very successful. Nonetheless, since the sonata was only completed the day before the recital – allowing Strinasacchi exactly one day to learn it - Mozart was obliged to play his part from memory because he did not have time to write the piano part. For him, that would not have been a problem at all. In 1785, Strinasacchi married Johann Schlick, a very fine cellist and director of the orchestra at the court in Gotha. At least one source guesses that Strinasacchi actually played regularly in her husband’s orchestra, perhaps becoming the first female orchestral player in history. However, there is no proof that she either played in or conducted the orchestra. In 1786, the couple had a daughter (Caroline), a pianist who later became an actress. In 1801, they had a son (Johann) who became a cellist and a luthier. That same year, Louis Spohr was appointed concertmaster of the Gotha orchestra. Whether the Schlick family was still there or remained there is unknown. That is very likely the case. Strinasacchi’s husband died in 1818 – one source says 1825. She subsequently moved from Gotha to Dresden with her son. Most sources state that her final performance took place in Rome in 1809. She would have then apparently been 45 years old. However, in the only letter of hers which has been found, dated 1824, she tells a friend that she is still making music. Whether it refers to private playing or public is anyone’s guess. It is known that the 1718 Stradivarius she played was sold to Louis Spohr in 1822. It quickly became his favorite violin. That violin eventually ended up with Miriam Fried, though it passed through at least ten others before getting to her, including August Kompel, Paul Stassevitch, and the notorious W.E. Hill violin dealer. Strinasacchi died in Dresden on June 11, 1839, at (perhaps) age 75. Mozart had been dead for 47 years. 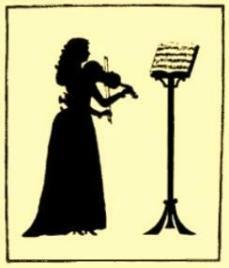 This silhouette of Strinasacchi is by an unknown artist. It is the only photo I could find.